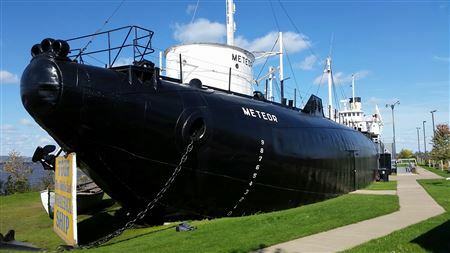 The S.S. Meteor Preservation and Stabilization Project is coming up fast. The date is April 23 & 24, 2016. S.S. Meteor 2015 Volunteers, Old Meteor Sign Removed, New Meteor Sign Installed, Painting the Vents and tanks on the Aft Deck, Before and after Photo of the Hull Painting. 4. Please bring any of your own safety equipment such as respirators, masks, knee guards, gloves, coveralls, shoes, boots, hats and warm cloths. Optional: Hard hat. 5. A liability release form from SPM will need to signed and handed into the staff. 6. Note: Tools such as paint scrapers, brushes, wiping rags, cleaners, and some respirator masks (Limited Quantity) will be provided. (Bring your own if you prefer). Please click on the link button to print, read, agree, sign and bring with you to hand into the SPM Staff. This project is the 12th Annual. The last ten years we put this Project together, we had a great turn out. We broke a record of 100 volunteers in 2014. We have an average of 50 plus people typically volunteering for this event! The folks from the Superior's Public Museum's Board of Directors were very appreciative with the efforts of all the organizations that helped make it successful! Let’s try making this event another successful year! Clean staff office-This year we will be tearing out the carpet. Clean exhibit case glass inside and out. Not needed this year because exhibits are under construction. Pressure wash entire outside of ship with pressure washer (Especially where bird droppings occurred on the Aft Starboard side of the ship). Warm water or car wash soap-DO NOT USE DAWN! Replace/install bird spikes where needed. Check Pigeons nest /roost areas on the aft deck under starboard turret along the conduit and wiring leading to pilot house (Spray tops of areas down with WD40, Pigeons don’t like the smell)! Remember you will be able to see where you have sprayed the WD40. Check oil level and condition of air compressor.Change if necessary.Check Air filter.Check and change if Necessary. Clean rust off valve rods on main engine (fore and aft) clean thoroughly and lubricate with light oil. (Use steel wool or Terry cloth)! Clean and paint rust lines on outside of ship from water draining down - Port side turret and stairways. (Please use Terry Cloth)! Apply another coat of white paint to areas that still need it in lower engine room. Paint the poles that hold lifeboat netting. (They only have primer on them)!Add more netting after paint dry’s. Paint forward deck-with anti-slip sand in paint. (Tile red) (If weather permits). Paint ceiling in display area on starboard side and other areas in the display area. (Need Scaffolding to complete this task). *Please Note: The tasks below will need to be done later on Sunday as we exit the ship. Paint Red rails on stairs in boiler room going up to engine room (Need to be painted red (or Yellow for caution and for safety reasons). Paint rails in Boiler room (Silver color) (Most are completed, there is more). Replace old switch, replace electric starter box, add hour meter if applicable and replace older fuse box with breaker box for electric motor that runs the main engine. Also replace wiring as needed or to bring it up to code. (Electric Motor specs – 10 HP, 230 V, 45 AMP 1750 RPM). (Motor cannot be installed until Jacking gears are installed)! (Mike Stone)? Create Manual to indicate lubrication points of main engine along with photos. - Tim Pranke – Leader. Clean brass fittings in lower engine room including brass fittings that were accidently painted. Clean Machinery in main engine room – Use stiff plastic brush and vacuum debris. Work with Sara/Tim to make sure nothing is damaged. Install black plastic corrugated drainage hoses on drainage pipes that don’t stick out far enough to keep water of the hull and stain it. (Watch and plan it in 2015 and possibly install during the 2016 project)?? Life Boat cradles on Starboard side, remove / lift straight up, perform welding repairs, clean, paint and replace rotting cradles under lifeboat. Cradles previously made by Tom Brueshaber. This process is very tricky. Ken Knutson is in charge of lifting! Place 1 in x 2 Ft. long solid steel rod in anchor chain to secure it from falling out of chain locker on Starboard side anchor. Remove Carpet in Office-all furniture taken out-scrub walls and floor-paint walls-put furniture back in. Caulk all vents, especially where water is leaking in. Pump out water in bilge below engine. Investigate possibility of a lower point for the water to exit the ship. Reseal leaking port in Captains Office Port aft side on top of Pilot House.Write plan on how it will be done! Rebuild rear turret door hinges by welding shut and re-drilling. Grease up gear and shaft currently in the office-put in bags. Clean up old concrete in the crew’s quarters 2nd mate room – haul it out with buckets and shovel.Prepare / clean area and apply lay down new concrete. (Painting the floor tile red later in the summer or next year). (Will need to paint primer on metal wall let dry then add concrete foam barrier, then lay in cement)! Make a drain within the concrete. Glue down all wood toilet seats with white silicone calking – Remove zip ties that are holding them down now. Move treated engine room wrenches from front entrance back to lower engine room. (Only after engine work and floor is painted and completed). Bring any remaining untreated wrenches up from lower engine room to send out for treatment. Rehang all recreated signs that were removed in 2015. (Reproduce and rehang).A trip to Office Max to scan and print may still need to be done. Locate and record all portholes that need to be replaced.Measurements will also need to be done. Look into installing new bulletin board cork on boards in mess hall / crews quarters. Replace missing light bulb guards (red & silver color) clean, paint and install. Paint walkway to front Cargo hold? More will be added, please check back. Time: 9:00 AM to 5:00 PM Saturday and 9:00 AM to 4:00 PM Sunday or until ……. Lunch: Will be provided by Grandma's Sports Garden. (Breakfast you will be on your own). This year, we will be meeting at Barker's Island Inn Restaurant (Barkers Island near Meteor) both mornings for Breakfast at 7:00 AM. Please Note: If you are staying in any of the campers or boats, please bring your sleeping bag, pillow and other sleeping accommodations. If you are staying at a marina, the showers are most likely open for use. This year’s Saturday night program, we will once again have the “free” Buffet Dinner. Like last year the Dinner will be at the Fair-Lawn Mansion in Superior WI (Not far from the Meteor). We will be offering free tours of the Mansion. You can also ask the SPM staff of the Museum to bring you on a tour of the ship you normally don't see on a regular summer tour! If you are interested in volunteering, please register for the project by clicking on "Register Now" button in the upper right hand corner of this page. Follow the step by step directions. Or, by contacting the Chairman of the event, Phil Kerber or, the Director of SPM Sara Blanck. Contact information for both Phil and Sara are below. Please don't delay in registering ASAP, this will help us determine the head count for the food and provide email communications for any additional information about the project. Over 60 volunteers from the GLSPS, SPM, WUAA and friends of the S.S. Meteor gathered for “All Hands on Deck” to perform twenty eight tasks to help stabilize, preserve and make ready for the 2016 season of touring the Whale Back Museum. Installed a large metal bar in anchor chain so that chain can’t accidently unroll out of chain locker. Cleaned Pigeon droppings and othe debris on hull. Added additional bird spikes on starboard side of ship to attempt to keep Pigeons off the ship. All brass in both Piot House and Engine room were polished. Smaller room on crew quarters received its first coat of paint (New room to see on the tour). By Dean Soderbeck and a couple of Sea Cadets. An estimate and plan was drawn up by Mike Stone for the Electrical rewiring and new box and switches for the electric motor running the main steam engine. An estimate and plan was drawn up by Mike Stone for the water draining issues on the upper aft deck and the streaks created by freely running water to the black part of the hull. Front of divers display was re-laminated on the top and lower face was cleaned sanded and painted by Dale Koziol. Removed old broken up concrete in 2nd mates room.It will still need additional preparation before adding new concrete.Done by Kari, Craig and Gunner David. Lighting in the Ships Entrance was installed by Joe and Tony Musial. Old safe was removed and placed in the main entrance to put donation box and Guest book on. Completed Main Engine Room Painting except for a small area where the primer paint didn’t completely dry. New front desk in entrance was installed and painted by Tony and Joe Musial and painted by Craig and Gunner David. Prepared all the crews quarters and mess hall room .Vacuumed and cleaned the rooms before installing the bedding. Many more tasks that were completed that didn’t get into this report. Thank you to all the volunteers that took the time out of their busy schedules to come up and help preserve maritime history on the S.S. Meteor! As I said in the past, I wished I could thank each and every one of you separately for you volunteer efforts but that seems to be hard to do. If you find time to join us next year again, please mark your calendars for April 29, 30, 2017 for the next S.S. Meteor Preservation Project. Please feel free to bring your family friends and colleagues.